Shed conversion ideas can really help you visualize what a space can look like when fully transformed. Not to mention, provide you with a good amount of motivation, as well. When most people think about a shed conversion, they envision a small hobby space. Or, a total upgrade and reorganization, making it fully functional for the intended purpose. But, you can go beyond the simple utility to get much more out of it. 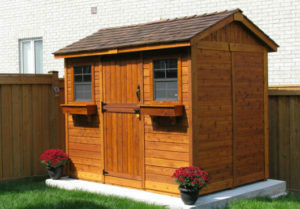 Before you start your shed conversion, you’ll first need to clear it out. While this might or might not sound like a lot of work, it’s where you must begin the journey. If you don’t regularly go into the space, enter slowly but only after you knock and make your presence known. Open the door with caution and wait a few moments to go inside. This is to avoid any run-ins with pests, such as insect, rodents, and reptiles. Take the time to empty out the space, leaving nothing inside. This way, you’ll have more motivation to purge. Give the interior a good scrub, deep cleaning it. Allow it to air out and give yourself time to imagine what it can serve as for you. Workshop. We’ll start with the most obvious. A workshop for whatever hobby or side hustle you might like. With just a few changes, you can easily remake the space from pure storage to fully functional. Guest suite. If you want more livable square footage but don’t want to incur the huge expense of a room addition, you can transform the shed into an actual guest suite, complete with a bathroom. Home office. Another consideration is to upgrade it to a home office. You’ll need to insulate and climatize it, just like you would for a guest room. But, it won’t require plumbing and other amenities. When you’re ready to start the shed conversion and need to get rid of junk, just phone 800-433-1094 or visit Junk Garbage Removal.